With a stellar reputation for providing exceptional service to thousands of local businesses, Zodiac Heating & Air Conditioning is the best choice for light commercial HVAC in the San Fernando Valley. We are a Carrier Factory Authorized Dealer and have more than 30 years of experience providing heating and air conditioning repair, service, maintenance, sales, and installation. 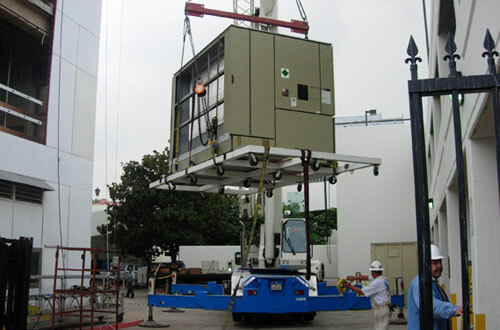 All of our HVAC service and installation technicians are factory trained and NATE certified. By consistently offering high-quality, reliable HVAC services with superior customer service, we've earned Carrier's highest recognition, the President's Award, three years in a row. Appointments can be made Monday through Friday, from 7:30am to 4:30pm, for routine services, and we also have live phone operators to answer your call 24/7. Our service area includes Van Nuys, Calabasas, Glendale, Pasadena, Santa Clarita, Simi Valley, North Hollywood, and all surrounding cities. Zodiac Heating & Air Conditioning, Inc. is a fully insured, licensed HVAC contractor. We also hold the following certifications: Puron Specialist, Carrier Healthy Air Expert, National Comfort Institute (NCI) member, Energy Upgrade California Registered Contractor, and a Building Performance Institute (BPI) Certified Contractor. Zodiac Heating and Air Conditioning, Inc. provides the best value in commercial heating and air conditioning service and repair in the San Fernando and Santa Clarita Valley. Since all of our HVAC service technicians are highly experienced and NATE certified, they are exceptionally qualified to diagnose and repair all major makes and models of commercial furnaces, air conditioners, heat pumps, packaged systems, mini-splits, and related equipment. When our techs are dispatched, they always arrive in uniform with a truck that is stocked with everything they need to get the job done, including the latest diagnostic and repair equipment as well as frequently needed replacement parts. Once on site, the tech performs a comprehensive diagnostic check of the HVAC system to ensure that they correctly diagnose the issue and catch any other potential problems that can lead to future issues. You'll be given an upfront quote to review before we begin any work, and we will honor our quote no matter how long the job takes. All furnace and air conditioner repairs are backed by a 90-day parts and labor warranty. Call today to schedule an appointment. Zodiac Heating & Air Conditioning, Inc. offers free on-site estimates for commercial clients looking to replace or upgrade their heating and air conditioning system. We sell and install all makes and models of commercial HVAC systems and offer a 100% satisfaction guarantee with a 10-year parts and labor warranty when we install Carrier equipment. By having our experienced HVAC experts create a customized solution for your property featuring today's high-efficiency heating and air conditioning equipment, you'll reduce your monthly energy bills, improve your indoor air quality, and reduce costs related to unexpected breakdowns and repairs. The key to keeping any business's heating and air conditioning system running cleanly, efficiently, and reliably is proper maintenance. At Zodiac Heating and Air Conditioning, Inc., we make it easy and cost-effective to have regularly scheduled furnace and air conditioner tune-ups with our Commercial HVAC Maintenance Agreements. Commercial HVAC Maintenance Agreement members receive two or more tune-ups a year, priority service, and 15% discounts on all repairs. If you are not ready to become a member, we also offer affordably priced one-time heater and air conditioner tune-up services. I've been working with Vic and his staff at Zodiac for more than 15 years, i can't imagine working with any other AC company, They have always made sure that we are taken care of and i trust them completly . . .